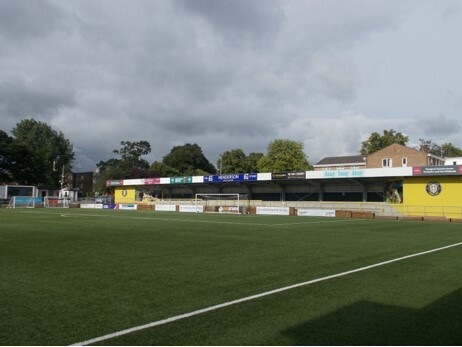 Just to prove that there are no easy matches in the National League,Harrogate were held to a disappointing 2-2 draw by relegation haunted,Maidstone United. Town made one change in their starting line up ,with Liam Agnew replacing Jack Emmett who has a hamstring strain. Town had a second minute chance when visiting keeper,Chris Lewington handled the ball outside the area,but Joe Leesley’s free kick was headed behind. when he broke down the right and shot across Town’s goal. However,on 21 minutes Town opened the scoring when Mark Beck nodded home from close range after Leesley’s centre had been headed back across goal by Callum Howe. A defence splitting pass by Josh Falkingham played in Lloyd Kerry,but his shot on the turn hit the advertising board on the stand behind the goal. Agnew and Ryan Fallowfield sliced shots wide,but Town had the ball in the net two minutes before the break when Beck turned in Kerry’s knock back across the goal,only to be denied by an offside flag. But Town were rocked to the core,when on the stroke of half time,Justin Amaluzor lashed a tremendous left foot drive past James Belshaw from the edge of the area. A superb strike from Falkingham soon after the interval forced a fine diving save from Lewington,but it was the visitors who struck next. broke down the left and hit a vicious cross shot into the far corner. Luckily,Town were given a route back into the match ten minutes later,when Jack Muldoon was brought down in the area by Swaine,and he sent Lewington the wrong way with his spot kick to level the scores. Which rattled the Stones crossbar. George Thomson and Aaron Williams replaced Agnew and Beck as Town pressed for the winner. Another Leesley free kick after a foul on Fallowfield found Kelvin Langmead in front of goal,but his header sailed just over the bar. Although Town piled on late pressure,Maidstone held firm and Town had to be content with one point which keeps them in sixth position.